With the double aim of reducing costs and making overtaking easier, the Formula 1 top management team, together with the Team and the Sponsors, has decided to introduce a Technical Regulation revamped in many sections for the 2019 season. An important consequence that will be immediately visible even to the less attentive will be the great aesthetic difference in the front and center of the new single-seater compared to those of the past year. The intent is to minimize the downwards thrust loss induced by the turbulence generated by the cars flow, that during last years was responsible for the 30% of the lost downforce. Reducing the amount of "dirty air" produced by cars should allow drivers to more easily follow a car and subsequently help open up additional overtaking opportunities. At the same time, efforts have been made to increase the DRS efficiency, to generate a greater speed difference between the cars and consequently to facilitate overtaking. The new technical regulations concern some important aerodynamic macro areas such as the front wing, the brake air intakes, the bargeboards and the rear wing, but not only. So let's start and discover them together. Instead the upper flaps, the "famous" external tunnel and the various internal and external profiles to the endplates will disappear. The wing cannot have more than five distinct elements in addition to accentuated arcuate forms (maximum 15 °) in the endplates, elements now almost completely defined by the FIA. Beyond that, two is the maximum number of flow conditioners to be placed below the wing. The purpose of these rules is to reduce the outwash effect of the front wing. 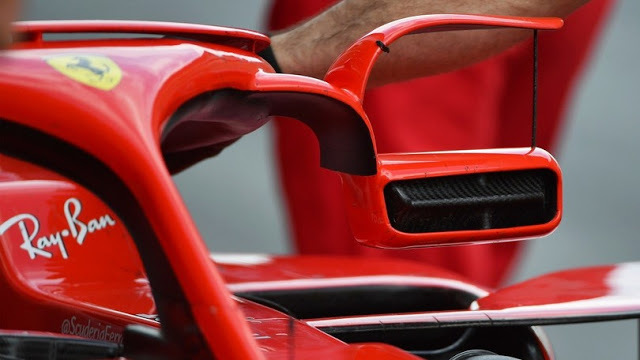 According to a Top Team, these important changes to the outer parts of the front wings will bring the various teams to add many details in the front area, to better control the flow directed towards turning vanes and bargeboards. The wing area had to be increased in order to overcome the losses in terms of aerodynamic load generation caused by the elimination of the above mentioned macro components. As written almost three months ago, these changes will lead the various teams to extend their cars wheelbase with, at least initially, a less exasperated use of the rake set-up; in short, it goes more in the direction of the macro aerodynamic concept preferred by Mercedes than in the much loved "short wheelbase" and the rear bumper of Red Bull and, in part, Ferrari. The lengthening of the wheelbase will not therefore be a consequence of the increase in the size of the petrol tank (from 105 kg to 110 kg loadable at the beginning of the race) but only an adaptation to the new aerodynamic rules that favor a macro aerodynamic concept compared to another. Why do we say this? Because although the most important change is certainly to be found at the front, the major problems the various engineers are finding are in the back area with very important losses in terms of aerodynamic load (at the front very similar to those of the last season load levels would have already been achieved). The FIA ​​has in fact removed a lot of aerodynamic aids that were used in the past mainly to influence the tires airflow and to seal the diffuser, avoiding deleterious loss of flow (energy) to the outside of the car. 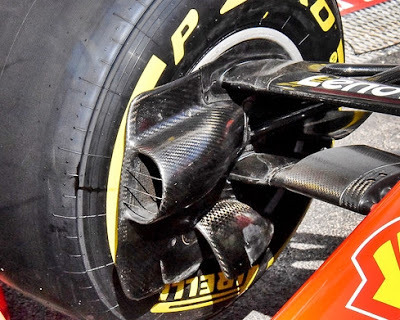 Without these elements it is certainly more complicated for the teams to be able to use a high diffuser angle (rake) without avoiding its stalling. Continuing, the FIA ​​also intervened on the front brake ducts (not on the rear ones), reducing their application as aerodynamic surfaces thanks to important changes to article 11.4.1. So, it will no longer be possible to add wing profiles in one of those areas where the various teams, in recent seasons, had developed various solutions to be able to manage the trail of the front tires and therefore have a greater cleaned flow arriving at the rear of the car. The size and shape of the cooling duct itself has also been somewhat limited with the inner surface of the cooling duct area that will have to stay within the rim perimeter and no longer even forward as we were used to until last season. In past seasons many teams, including Ferrari, have developed systems which were able to expel the air directly from the front hub; the main purpose was to deviate outwards the flow between the wheel and the body, then, reconnecting to what was written in the previous paragraph, to manage the trail of the front tires in the best way. The new version of Article 11.4.3 now establishes that the airflow cannot pass through a 105 mm diameter circular section from the central axis of the wheel and its attachment (the wheel nut). It should be noted that no other means have been banned to channel air through the wheel for a (however minor) aerodynamic gain such as for example the Mercedes rim "holes" tested at the end of last year. 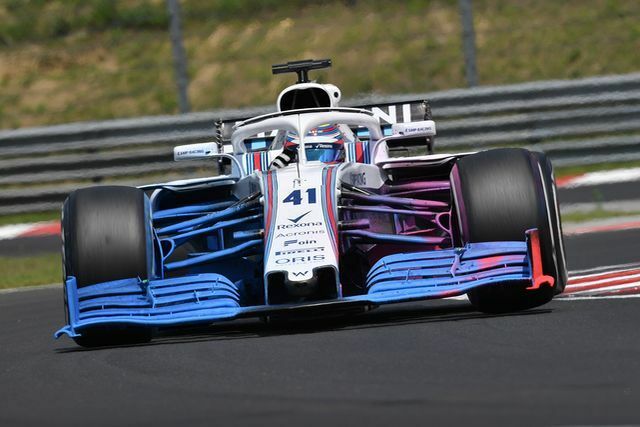 To give more visibility to the sponsors positioned in the central part of the car, the area where it will be possible to install aerodynamic appendages also called bargeboards has been modified. We recall that these components play a very important role in directing the flow beyond the leading edge of the floor and in managing the air around the bellies. Next year the height of the bargeboards will be reduced by 125 mm, around 25% (475 mm was the 2018 height) and their curvature will also be reduced thanks to the introduction of a longitudinal line of 4.5 ° from the center line of the car. 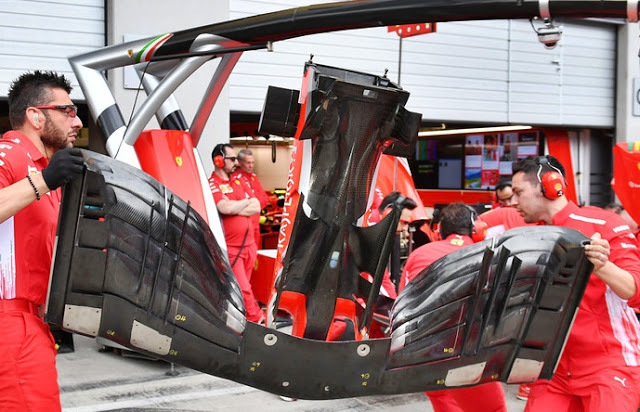 Following the question raised in the Spanish GP by various teams, including Mercedes, towards the Ferrari mirrors (see the picture), the FIA ​​has worked to “close” the gray areas available to the Teams in the 2019 Technical Regulations. The number of supports connected to the body has been limited to two (only one can be connected to the cockpit), to prevent the teams from using them with the main function of flow conditioners; these are the most important changes in this macro area. It will still be possible to have ventilated zones, introduced by Ferrari last year and then copied by Toro Rosso and Red Bull during the season. 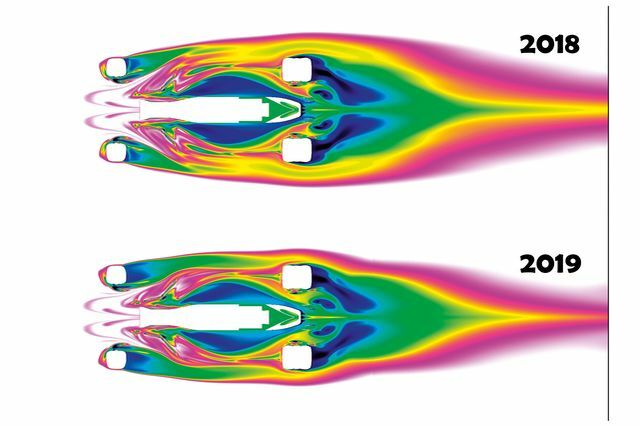 An increase in drag resistance coupled with the larger section of the mobile wing will make the DRS effect even more powerful (30%), with a consequent greater speed differential between the cars on the straight. It will be interesting to understand how the various teams will set up the distribution of the load between the rear wing mainplane and the mobile part. And here a very important matter: in qualifying the DRS can always be opened in the areas imposed by the FIA ​​while in the race only if it is less than a second from the car that precedes. A load aerodynamically set up can be more masked in qualifying thanks to the important help given by the opening of the DRS, advantage that will certainly disappear if not become a handicap then in the race. 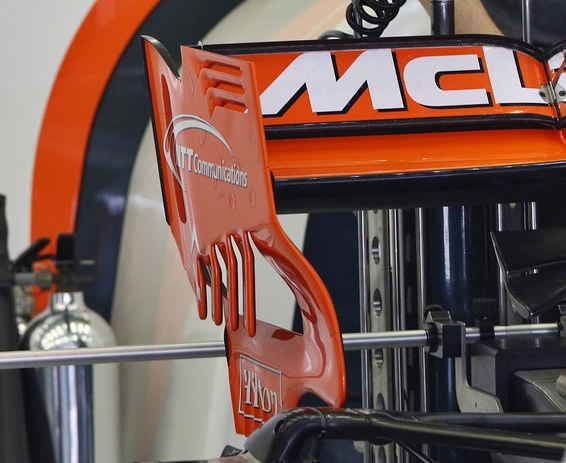 It should also be noted that the 2019 technical regulation does not allow the use of the classic channels (top) and the saw tooth profiles (introduced by McLaren and then copied by many other teams) on the endplates for a reason, even in this case, purely commercial. We will therefore see much cleaner endplates that will put more light on the sponsors. It is very likely that we will continue to see some slots at the bottom of the endplates instead. At the beginning of the race, the cars can embark up to 5 kg more of fuel, going from 105 kg to 110 kg. The purpose of this change is to allow drivers to be able to push their Power Units for as long as possible in the race, trying to cancel the excessive fuel economy that has created some bad mood especially in the drivers in last seasons. An important and much requested innovation by pilots is the weight: from the 2019 season we will not only talk about the minimum weight of the car / driver but the minimum combined mass of the driver and the required ballast that will be 80 kg. A part of regulation that should have been introduced years ago. 4.6.1 The weight of the driver with his seat and the driving equipment will be established by the FIA ​​technical delegate at the first event of the championship, this reference weight can be changed at any time during the championship season, if deemed necessary by the delegate FIA technician. This reference weight will be used to establish the minimum weight of the pilot and ballast referred to in Article 4.6.2 below. 4.6.2 The reference weight of the driver will be added to the weight of any ballast designated for this purpose and, at no time during the event, may be less than 80 kg. With the regulations of the past years we were going in two completely opposite situations: the cars became increasingly "fat" while, on the contrary, the drivers needed more and more diets to stay in the 740 kg imposed by the regulation (743 kg in 2019). Calculating that 10 kg of mass cost about 3 tenths per lap, until last season the highest and most "fat" pilots were certainly penalized. 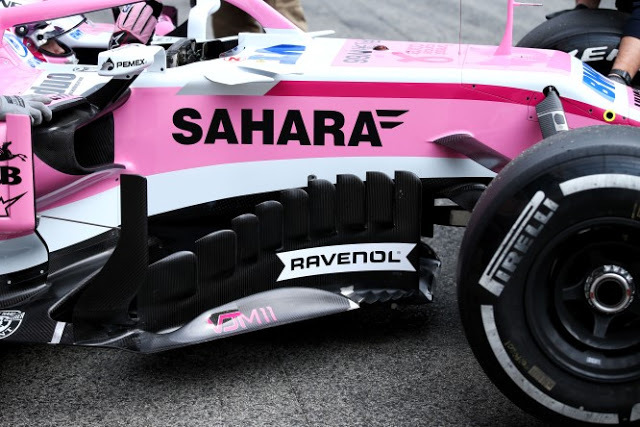 From this season, all teams will have to emulate the effect of having a mass of 80 kg linked in the car, attaching the necessary fixing it to the survival cell between the front and rear extension of the cockpit entry model. 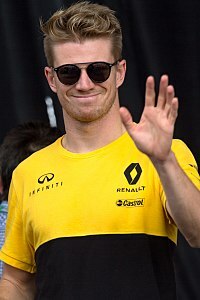 This will also allow bigger drivers like Hulkenberg to have some freedom in terms of diet and also in terms of training with pilots who will certainly be able to put more muscle mass to counteract the high G forces present with these new generations of cars. In the next season, in wet conditions there will be three rear lights on the new cars and not only the classic single central light. 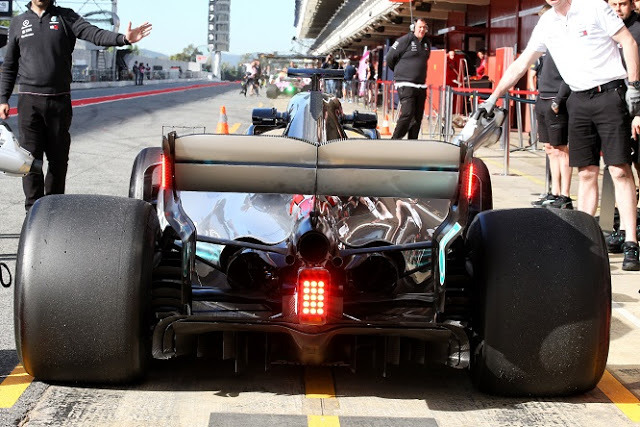 In fact, two bright LED strips measuring 120 x 30 x 5 mm will be introduced on the back of the endplates mounted inside a casing made entirely of aluminum like those tested on the W09 in the post-Grand Prix tests in Spain last May. 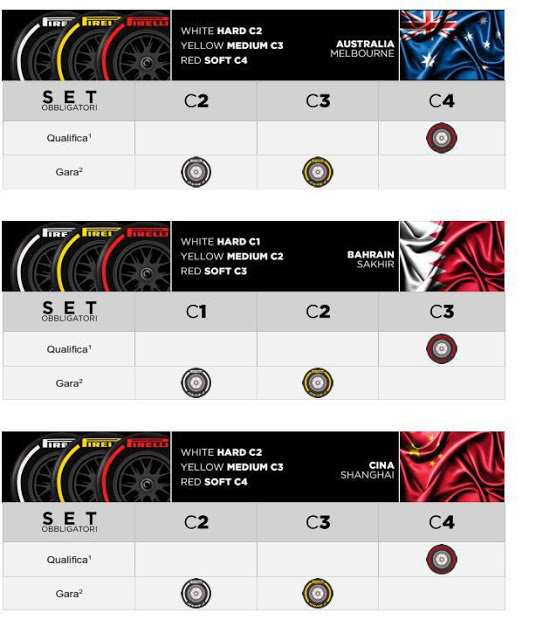 For the 2019 season, Pirelli will introduce a new coding system for its tires: in every single race we will talk only about Hard (white), Medium (yellow) and Soft (red) compounds which will come out from the selection of 5 compounds called C1 ( the softer), C2, C3, C4 and C5 (the hardest). 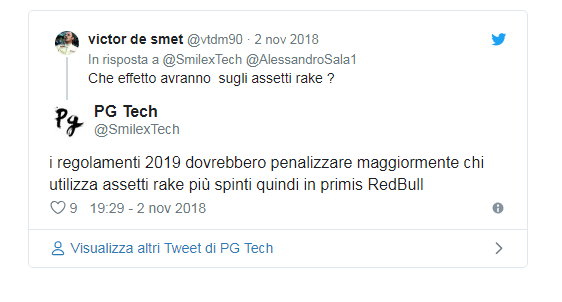 Sono un individuo che offre prestiti a livello internazionale. 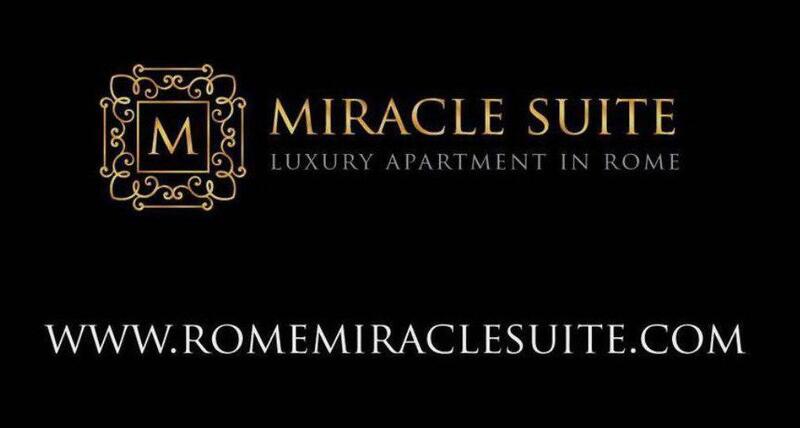 Con un capitale che sarà utilizzato per concedere prestiti tra individui a breve e lungo termine che vanno da 2.000 € a 200.000 € a tutte le persone serie che si trovano nei reali bisogni; Il mio tasso di interesse è del 2% all’anno. Concedo prestiti finanziari, prestito immobiliare, prestito d’investimento, prestito auto, prestito personale. 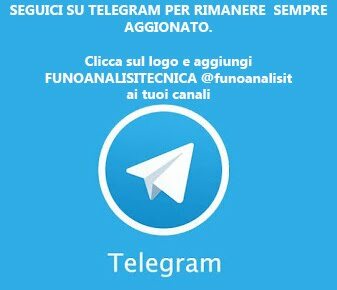 Sono disponibile a soddisfare i miei clienti entro un massimo di 03 giorni dalla ricezione della richiesta di credito. IMPORTANTE: Nessuna persona seria si astiene.